This Cambria Community Services District Board of Directors pulled a fast one on Cambria’s rate payers. It’s an old con trick called the “pig in a poke” or “bait and switch.” The con is that the item marketed is not the item given and this reality is learned only after payment. Think of the old story of the trusting person buying real estate sight unseen in Florida only to find on arrival that it’s under water. In the “bait” part of the con the district board told rate payers that they would build a portable brackish water desalination plant to provide water only for existing customers and only during the dry season when the town needed water. The district asked for a rate increase to pay for this “emergency water supply” project and trusting rate payers agreed by not protesting the increase in the Proposition 218 process. The district also applied for a $4 million state grant offered for emergency water projects. The “switch” part of the con is what the district board is in the process of passing off – a permanent public works project for year-round production of water for new development. Since the district had to reveal this truth sooner or later, it tried to sugarcoat the switch earlier this year by framing it as a “rebranding” and “repurposing” of the project, just as if this was standard public agency procedure. They “rebranded” the plant from the name they used to get the rate increase – “emergency water supply project” (EWS) – to the “sustainable water facility”, and “repurposed” it from dry season water for existing customers only to year-round production of water for new development. 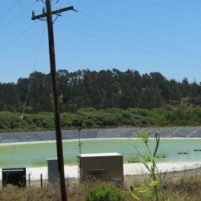 While the basic infrastructure is the same, these are separate projects under the California Environmental Quality Act and the Coastal Act and are worlds apart in terms of impacts to the community and the environment. The board did not provide a noticed public hearing to discuss the pros and cons of the “sustainable water project” with they’re fellow Cambrians who were denied their right to participate in the decision to proceed with it. And while the board has not publicly discussed or disclosed an assessment of construction or operation costs of this plan, it is the subject of the environmental impact report the district recently released. Apparently, the current board of directors thinks it’s OK to obtain a rate increase by telling the community it will spend the money on one project and then spend it on another. But it’s not. It’s a misappropriation of public funds. And, this board apparently thinks it’s OK to make decisions that impact the public welfare and involve multi-millions of rate-payer dollars behind closed doors. But it’s not. It’s a violation of the Ralph M. Brown Act open and public meeting law, which requires public agencies to discuss and make decisions in public. Hopefully, enough Cambrians will want to have this important public discussion before it is too late and elect a board majority who will follow the law and provide it. Cynthia Hawley is the co-counsel for LandWatch San Luis Obispo County. The City of SLO did the same thing with the Nacimiento pipeline. They declared 80% of the cost to be paid by current ratepayers for “reliability” and 20% for build-out to pop. 53,000 (they did a “study”). The fact is, developers didn’t want to pay for the additional water source and whined about their sincere and heartfelt desire to make housing “affordable”. The house went for whatever market and it was all became pure profit. $162,200,000 transferred to the developers by the city in the form of ratepayer debt. Rates have tripled through this process. And who is allowed to cash in this lottery win is very, very political. Oh yeah, the City promised a comfortable 2,100 afy reserve, but has now decided the reserve isn’t necessary and we can keep building. VOTE FOR HEIDI HARMON and drain the swamp. Anyone casting the down votes care to reply? Didn’t think so. Jan?